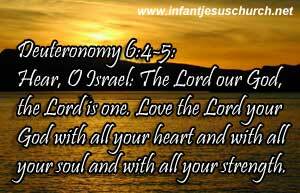 Deuteronomy 6:4-5 Hear, O Israel,The Lord our God, the Lord is one. Love the Lord your God with all your heart and with all your soul and with all your strength. The first principles of faith and obedience for the entire humanity. The Lord our God is the only living and true God, he only is God, and he is but "The One". Let us not desire to have any other and should not have. The three-fold mention of the Divine names are, and the plural number of the word translated God, seem plainly to intimate a Trinity of persons, namely Father , Son and Holy Spirit even in this express declaration of the unity of the Godhead. Happy those who have this one Lord for their God. It is better to have one fountain than a thousand cisterns, one and all powerful God than a thousand insufficient powerless. This is the first and greatest commandment of God's law, that we love him, only him and that we do all parts of our duty to him from a principle of love, says my son, give me your heart. We are to love God with all our heart, and soul, and might. i.e. With a sincere love, not in word and tongue alone, but inwardly in truth . Secondly with a strong love. He that is our All, must have our all, and none but he only. Thirdy with a superlative love, that is everyone must love God above any creature whatever, and love nothing but what we love for Him. Fourthone is with an intelligent love. To love him with all the heart, and with all understanding, we must see good cause to love Him and must. Lastly With an entire love, he is ONE and the THE ONE, our hearts must be united with his love. That this love of God may be shed in our hearts. Heavenly Father, We adore and honor you as God Almighty. We appreciate you for all your kindness and blessings lavished upon us, especially the gift of Infant Jesus. We love you because you first loved us in Jesus. My heart's desire today is to demonstrate our love for you in all we do, and love and say. Through Infant Jesus. Amen.